The modern, spacious attic apartment in the house Alpen-Träumli invites you to linger: on the spacious balcony (23m2) you can enjoy a magnificent view of Lake Thun and the mountains of the Bernese Oberland with Eiger, Mönch and Jungfrau. The apartment is very quiet. Depending on the season is even the observation of wild animals is possible (deer, foxes, chamois, ibex). The living area is cozy. The visible roof construction and comfortable armchairs and a sofa contribute to this. Thoughtful architecture: From the garage or the parking space, you can get on dry days even in bad weather and comfortably with the elevator to the apartment. Bed, bath and kitchen linens are included in the rent, as well as electricity, water, heating, W-LAN! The fact that the apartment has two bathrooms, contributes significantly to the comfort. The bathroom is directly accessible from the parents' room, toilet / shower are located in the second bedroom. Bed, bath and kitchen linen are included in the rental price. Result of the official classification by the Swiss Tourism Association: **** 4 stars (max 5 stars) Environmental aspects: The electricity in the apartment comes from 100% renewable sources and is naturemade basic - certified. The heat generation for hot water and heating is supported by solar energy. As arrival day is often only the Saturday released. Exceptions are possible; please make a request. This apartment was our absolute favorite. It had everything a family of four needed - and then some. The owners were very quick to respond and easy to communicate with. Getting there was easy and the directions were very clear. We loved staying out of more touristy Interlaken with easy access to everything we wanted to see and do (Schilthorn, Jungfraujoch, St. Beatus Hohlen, etc.). The view never failed to take our breath away. Thank you for providing such a wonderful experience. I am glad that the stay in our apartment was a wonderful experience for our guests. The place is wonderful, a sight that leaves you breathless. Despite being a 15 minute drive on a very winding road from the town of Interlaken the apartment is impeccable, new furniture with fully equipped kitchen, all you need for a perfect stay. Only issue was the check out time, to give time to leave everything in order, especially with children. Ideally to be able to stay at least until, noon. But I would stay here again. 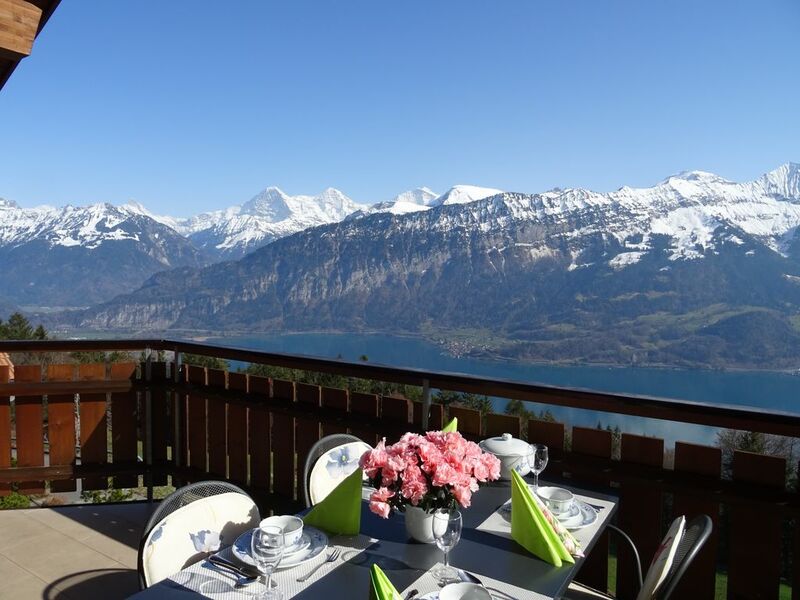 The chalet was very well appointed with an exceptional view of lake Thun and the Alps. We enjoyed Beatenberg for hiking. The hosts were easy to communicate with and made every effort to accommodate us. I would highly recommend this apartment!!!! Thank you for this review. I'm glad that you had a good week in our apartment. The property was neat and clean and the elevator was an added bonus. We recently stayed in this Beatenberg apartment. As other reviews stated - the view was magnificent. We had rain 2 out of the 5 days we were there - but even that didn't make our stay any less special. The low cloud cover viewed off the deck was just as wonderful as the days it was sunny and we could see all of the surrounding mountains, Lake Thun and Interlaken. Hearing the cow bells below us was an added pleasure. We were able to knock off all the areas of interest on our bucket list that we wanted to see. The roads up were pretty twisty - but to get that view was worth it. And after all we WERE in Switzerland and the mountainous area is a given. The apartment was super clean, with everything provided that was promised. The relaxing music CD's were great with dinner every evening. The small grocery store in Beatenberg had all the basic staples needed plus delicious bakery items we didn't. We would rent this apartment again in a heartbeat. Thank you for this kind review. I see: I you loved the place, the region and Switzerland. That is great. Also the location is perfect to explore all the area. We did not want to leave it! Beatenberg is a wonderful sun terrace in the Bernese Oberland. The view of Lake Thun and the mountains (particularly the Eiger, Mönch and Jungfrau) is unique. The world-famous town of Interlaken is 15km, from there the Attractions Grindelwald, Wengen and Mürren are easily accessible and of course the Jungfraujoch, the höchte station in Europe: Top of Europe. Who in addition also places and ways estimates where not come all tourists is on the Beatenberg in the right place. When planning your trips you will appreciate the central location. All known locations such as Interlaken, Grindelwald, Wengen, Mürren (Schilthorn), Jungfraujoch, Brienzer Rothorn, Adelboden, Gstaad can be reached easily by car or public transport. About the free Internet access (Wi-Fi) you have access to all necessary information. From a simple stroll through the shopping to the modern trend sports keeps the Bernese Oberland provides a myriad of services. Ski: Beatenberg has several lifts and a Swiss ski school. The major ski resorts of Grindelwald, Wengen and Mürren (Schilthorn) are easily accessible by car.